Brasilia (Agenzia Fides) - "The serious and often irreversible damage and violations of human rights and the rights of nature caused by the current mining model, promoted, sustained and nourished by the immoral, inhuman and unnatural enrichment of big mining multinationals and countries of origin, in a new, more aggressive phase of colonization and looting" which leads to the consequence that "our peoples are condemned to a present and a future of destruction and death" therefore "it is urgent to put limits to this model of extractive development, as Pope Francis emphasizes". 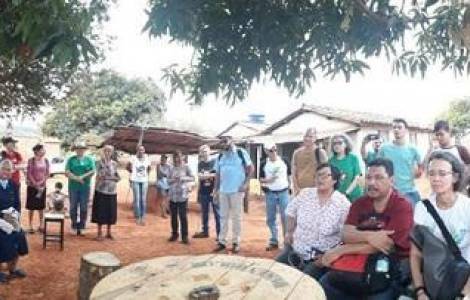 It is a passage from the "Public Letter to our Churches, organizations and society", just published, which collects the fruits of the meeting held in Brasilia, from 7 to 10 August. Representatives of religious organizations, movements and families from various countries of Latin America and the United States, as well as Germany, met in the light of the encyclical Laudato Sì and the Pastoral Letter on integral ecology, "Disciples and missionaries, Custodians of the creation" of the Latin American Episcopal Council (CELAM), to share the challenges, struggles and hopes of the communities affected by mining. "This meeting - reads the open letter sent to Agenzia Fides - allowed us to renew our mission to contribute to the construction of new relationships with nature, not as a producer of wealth, but as our sister and mother, with inalienable rights, which shares and sustains the life of Creation in search of the Good Life and the Well-being of all beings that are part of this common home". In addition to the damage caused by the mining extraction there is that of the privatization of rivers, for the multiplication of companies producing electricity, and the expansion of the activity for the extraction of natural gas. "All these types of mining, far from advancing towards greater responsibility in the care of the common home and life - is written in the text - their destruction accelerate and condemn millions of people to survive in precariousness, victims of diseases derived from contamination of water, land and air". During the meeting the painful testimonies of the victims of mining and of the defenders of mother earth were presented, and the responsibility of this situation was found, from which the governments of Latin America are exempt: "on our continent, for example, 60% of the murders concern defenders of rights and community leaders". Called to give, as Churches, reasons for faith and hope that "another world is possible, where respect and care for the natural life of which humanity is a part prevails", the participants then make a series of recommendations. First of all, they reiterate their commitment to "denounce these death practices and to call for structural changes" both to limit abusive and irresponsible extractive activism, and to put an end to the "complicit tolerance of our governments". They also reaffirm their will to continue "to promote life, supporting the efforts and struggles of the communities involved in mining and other projects that seriously affect the life and future of mother earth and all the human beings it supports". The leaders of the Churches are asked to "make a greater commitment towards those who suffer the consequences of this economic model of unbridled production, of uncontrolled consumerism". States are asked "greater responsibility in the administration of the common good, a decisive fight against corruption, to activate and rigorously control norms and laws that guarantee human rights, individual and communal, the rights of nature and the fundamental right of peoples to decide on its own development, guaranteeing effective consultation processes" and respect for the decisions taken.